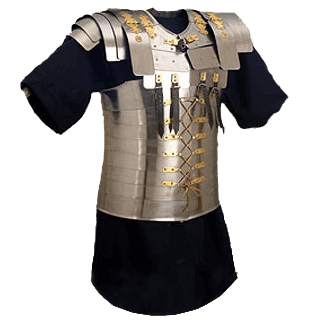 The Lorica Segmenta is the most widely recognized Roman armour. With a very distinct design consisting of upper and lower sections, this Lorica segmenta is a must for any Roman warrior. The torso is made of eight horizontal plates that wrap around the body and lace in the back and front. The torso is buckled onto the upper body section which also has pauldrons attached. The armour is crafted from 18 gauge steel and includes all leather straps, buckles and lacing needed for wearing. We recommend any of our gambesons to be worn under the armour for comfort and ease of movement without any pinching. It is great for LARP, Theater, Costumes, and the SCA. Check with your local chapter for approval. Size Large.